Why Are Open-Ended Questions So Important? What kinds of questions are you asking your clients? How do you know which questions to ask and when to ask them? Some of the most successful salespeople are those who have learned the art of asking open-ended sales questions. Selling is game of questions. Successful sales professionals have developed a knack for tuning into nuances and details of their client’s responses. 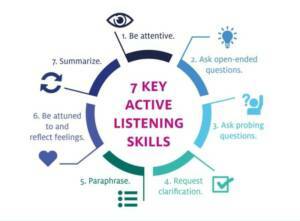 They listen with intensity and make adjustments to their questioning based on what the client is saying. The majority of salespeople will listen to a story politely and then go into their sales pitch, but are they really listening to what the client is saying? Some people don’t listen and are really just waiting for their turn to deliver the sales pitch. The art of asking open-ended sales questions involves tuning into keywords, themes, and patterns within the customer’s story and developing a sense of curiosity around these factors of communication. 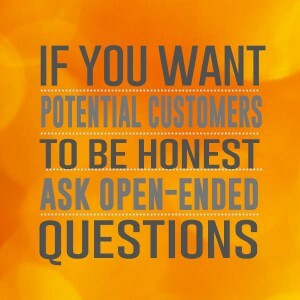 Open-ended sales questions are questions that allow more information to come forward. Since open-ended questions don’t limit the scope of the client’s answers to “yes” or “no”, they are effective in that they allow clients to convey more detail with their specific needs and objectives. Open-ended sales questions reveal additional information and insights regarding the product or service. Asking the right questions and probing client responses will allow you to address the specific needs of the customer. Understanding the potential buyers’ interests will help you to offer a product or service that is the most suitable for them. What areas of tracking do you feel your current software is missing? Give your customer enough time to convey information and listen carefully to what they have to say. You will have a more complete picture of the problem, which allows you then to provide a more specific description of how your software or product can solve those gaps and issues. Patience is your friend. Take time to mentally think about the right questions. Invest some of your time in crafting your own open-ended sales questions. It is an indispensable sales tool that allows sales professionals to effectively qualify sales opportunities, establish trust, build rapport, and gain credibility with customers. Mastering the art of asking open-ended sales questions will allow you to build more meaningful relationships with clients. They allow you to connect with your clients on a more personal level so that you can better understand their problems and develop real solutions.